Sunsilk Radiant Shine Shampoo and Conditioner both comes in a light sandal colour package with golden colour flip open cap. The shampoo comes in a sturdy plastic bottle and the conditioner comes in a tube like package. I have to say that the packaging is looking so stylish. 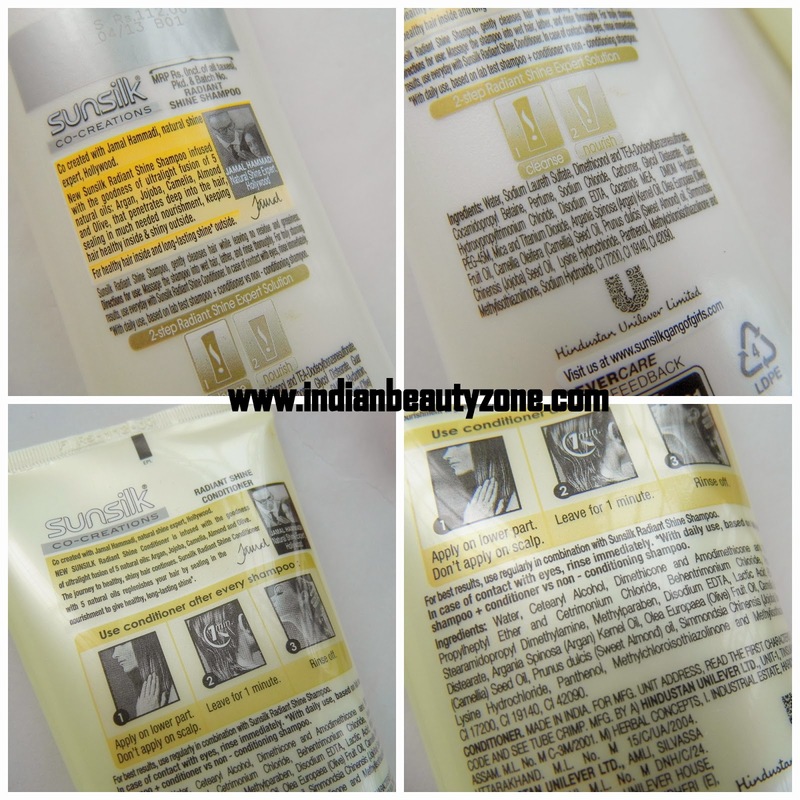 The colour of the shampoo and conditioner both are looking half white or sandal in colour. The texture of the shampoo and conditioner both are bit runny and the smell I am loving it so much, it is a strong fruity smell. I love this shampoo's smell which is fruity fragrance and gives you the real feel of containing oils namely Almond, Olive, Argan, Jojoba and Camelia. I have been using it for more than two months now and the experience is really good, it works well on my hair which is really dry one and the oil + shampoo and conditioner combination really makes my hair feel soft and shiny, remember this is not a hair fall solution and it didn't stop the regular hair fall problem that I have and I have no complaints as they don’t claim to reduce the hair fall, instead this product is for those who needs to have vibrant, soft and shiny hair. The other good thing about this product is compared to other shampoos the quantity needed is bit less as it lathers well with minimal amount and this may give you additional hair wash (At least to me). The shampoo itself is real good as it contains oils which make the hair real soft and with the application of conditioner the hair becomes more soft and easy to comb which is really good. Makes hair shiny and soft. Shampoo never makes my hair dry. The Conditioner helps the hair to retain its moisture well. I recommend this product to everyone and especially if you want to try a shampoo which is not meant for hair loss or other hair treatment, it doesn't harm your hair and for me it didn't lead to hair fall which I’m prone to, give it a try and have a vibrant and shiny hair. Hello all, I am Keerthi working in IT company and a mother of 3 year old girl. My skin is normal to dry type with fair to medium skin tone. My hair is wavy with medium length. My scalp is normal and my hair ends are dry one.